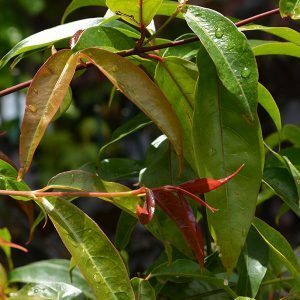 A small evergreen tree fromChina to Vietnam, Acer fabri may not have the autumn tones of some of the deciduous varieties, however it does have good spring colour with red new foliage. Reaching around 5 – 8 metres in height in its natural environment, in cultivation it is often smaller growing. Mid to deep green foliage with a glossy look to it, it is the red spring foliage along with the winged samaras, also red that add extra colour. Foliage is unlobed and slender, lanceolate in habit. The green foliage makes a good foil for the small white flowers which are followed by bright red, winged seed pods or samaras. In warmer areas this is evergreen, in cooler areas it may lose some foliage and be semi deciduous. This is a slow growing evergreen maple that grows best in a humus rich well drained soil. Best grown in a well drained soil, humus rich and in full sun to afternoon shade. The warmer the climate the more shade. On planting digging a little well rotted compost and cow manure. Stake the new plant and water in with a liquid seaweed fertiliser. It will grow well in full sun in cooler climates, in warmer areas some afternoon shade is recommended. In cooler climates Acer fabri may be semi deciduous..
Once established, little extra care is required. Pruning is generally not needed. Acer fabri is available for sale from the following nurseries.